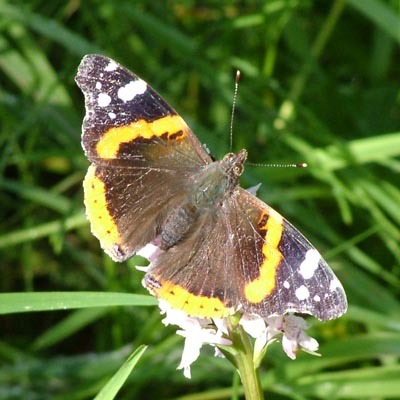 The Red Admiral is an immigrant species, breeding in the Mediterranean area and arriving here in May. They breed locally, the larvae feeding on Nettle (Urticaria dioica), with one brood emerging in August or September. So we have two sets of adults: Earlier immigrants and later natives. There are reports that the new adults fly south in late autumn in an attempt to reach warmer climates for winter, and there are a few records of the species successfully over-wintering in sheds or greenhouses, but most are thought to perish. This very tired specimen was photographed on 26th June, 2004, and is clearly an immigrant. This specimen, however, was photographed on September 28th, 2004 and is clearly fresh and clean, and hence very likely to be a local. There was an influx of Red Admirals in late August last year, so this is almost certainly the offspring of those. The caterpillar of the Red Admiral butterfly varies in colour. The young specimen on the left is about 15mm long. The fully-developed specimen on the right is is 35 mm long. The young caterpillar makes this distinctive (and typical) shelter. The larva bites the leaf in precise locations and then pulls the leaf together with a web. The leaf bends in a predictable shape to produce a shelter for its future development. A number of these shelters are made as the larva grows, and the final shelter for pupation is created by toppling the entire tip of a nettle plant. The chrysalis of the Red Admiral is usually hidden deep inside a leaf-shelter in Nettles, and is very difficult to photograph. This captive specimen shows the shape and colouring.